Ubatuba, a municipality with great swathes of lush, green forest and over 100 beaches, offers plenty of excitement and relaxation to suit a range of itineraries. Start off your visit on the 19th (Fri): observe the fascinating underwater world at Tamar Project, observe the fascinating underwater world at Ubatuba Aquarium, and then browse the different shops at Villa Guarani. Here are some ideas for day two: stroll through Domingas Dias Beach and then stroll around Corcovado Peak. To find photos, other places to visit, where to stay, and other tourist information, you can read our Ubatuba journey planning app . Sao Paulo to Ubatuba is an approximately 3-hour car ride. You can also take a bus. The time zone changes from Brasilia Time to Amazon Time, which is usually a -1 hour difference. Cap off your sightseeing on the 20th (Sat) early enough to travel to Ilhabela. 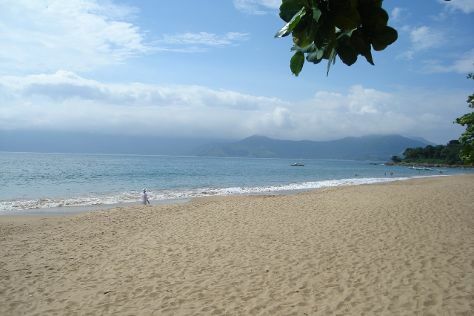 Translated as "beautiful island," Ilhabela has the natural landscape to live up to its name. On the 21st (Sun), kick back and relax at Praia Da Feiticeira and then enjoy the sand and surf at Curral Beach. To see traveler tips, more things to do, reviews, and more tourist information, refer to the Ilhabela trip planner . Do a combination of taxi and ferry from Ubatuba to Ilhabela in 1.5 hours. Alternatively, you can do a combination of bus and ferry. Due to the time zone difference, you'll lose 1 hour traveling from Ubatuba to Ilhabela. In April, daily temperatures in Ilhabela can reach 32°C, while at night they dip to 20°C. Cap off your sightseeing on the 21st (Sun) early enough to travel to Caraguatatuba. Sprawled across a wide, smoothly curved coastline, Caraguatatuba makes the most of its beaches, with warm weather, inviting waters, and expanses of white sand. Start off your visit on the 22nd (Mon): enjoy the sand and surf at Mococa Beach and then enjoy the sand and surf at Praia da Cocanha. For where to stay, traveler tips, photos, and tourist information, you can read our Caraguatatuba vacation builder app . Traveling by combination of ferry and taxi from Ilhabela to Caraguatatuba takes an hour. Alternatively, you can do a combination of ferry and bus. Expect a daytime high around 32°C in April, and nighttime lows around 23°C. Finish up your sightseeing early on the 22nd (Mon) so you can go by car back home.